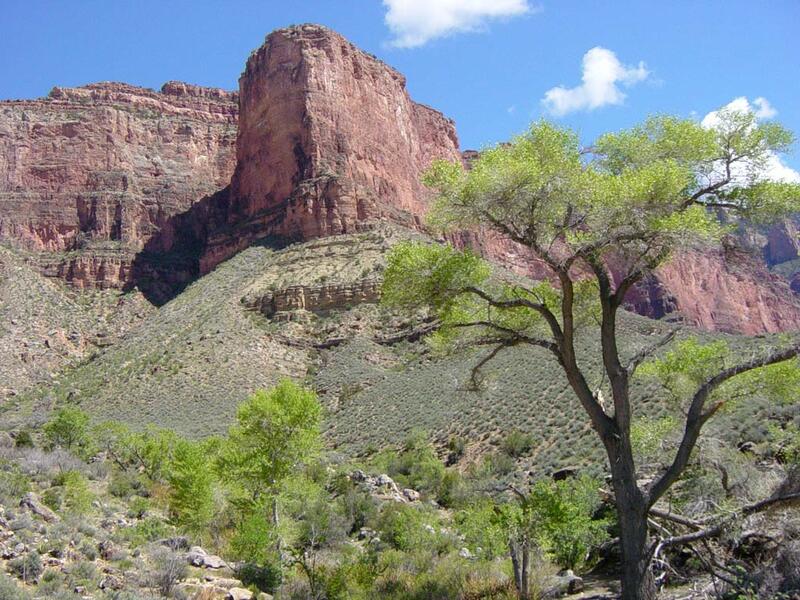 While we can’t say how many individual trees exist in the Grand Canyon, we do know that there are around 200 species.3 Most live on the North and South rims at high elevation. You won’t likely encounter a white fir or a blue spruce down at the river; however, western honey mesquite, catclaw acacia, and exotic tamarisk4 (AKA saltcedar, an invasive species managed by the park5) will be common sights. If you happen to hike the Bright Angel Trail on the way into or out of the Canyon for your trip, you’ll have the opportunity to pass through a number of different ecosystems roughly divided by elevation, each featuring different types of trees. The community immediately below the rim to about 4,000 feet is the Pinyon-Juniper Woodland.7 This area is dominated by drought tolerant pinyon pine, Utah juniper, and one seed juniper trees. From about 4,500 feet to 1,200 feet is the Desert Scrub ecosystem.7 Here you’ll see a lot of by scrubby bushes rather than trees, though you will encounter some of the trees that thrive in the riparian zone at this elevation as well. So, when you take a trip down the Colorado River, don’t forget to hug one of the 3 trillion trees on earth that you encounter on your wilderness river adventure! 1 – New York Times "Lots of Trees to Hug: Study Counts 3 Trillion Trees on Earth"
2 – BBC News "Earth’s trees number ‘three trillion’"
5 – Invasive Weed Awareness Coalition (IWAC) "Taking Back The Grand Canyon from Tamarisk (Saltcedar) Infestation"
7 – National Park Service "Grand Canyon Ecosystems"
9 – "Biotic Communities of the Colorado Plateau"